The Delaware River is a large river estuary in the Northeast United States. It is about 280 miles (450 km) long. It begins in the Catskill Mountains in southeast New York State and ends at the Atlantic Ocean at Delaware Bay. It forms the border or part of the border between the states of Pennsylvania and New York, Pennsylvania and New Jersey and also between Delaware and New Jersey. 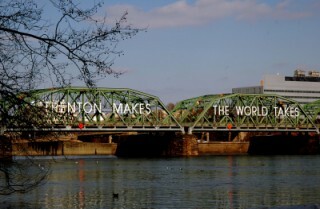 The cities of Trenton, New Jersey, and Philadelphia, Pennsylvania are on the Delaware River. Another name for this river is the South River. It is named for Thomas West, 3rd Lord De La Warr, a colonial Governor of Virginia. This page was last changed on 6 August 2014, at 20:54.